WHO/Europe has launched a new Health Evidence Network Synthesis Report exploring the implementation and effectiveness of policies based on the New Nordic and Mediterranean diets. Research has demonstrated the health-promoting properties of the Mediterranean and New Nordic diets, including protective effects against cardiovascular diseases and type 2 diabetes. However, guidance is lacking on how to effectively translate the health benefits of these diets into specific, measurable and achievable policies that improve dietary behaviours at the population level. The report summarizes the best available evidence to map what has been implemented in the European Region and will support policy-makers in making informed decisions. The traditional Mediterranean diet originated in the olive-growing areas of the Mediterranean region and has a strong cultural association with these areas. The diet is characterized by a high intake of plant-based foods (fruit, vegetables, nuts and cereals) and olive oil; a moderate intake of fish and poultry; and a low intake of dairy products (principally yoghurt and cheese), red meat, processed meats and sweets (for which fresh fruit is often substituted). Social and cultural factors closely associated with the traditional Mediterranean diet, including shared eating practices, post-meal siestas (afternoon naps) and lengthy meal times, are also thought to contribute to the attributed positive health effects recorded in the Mediterranean region. The New Nordic diet shares many characteristics with the Mediterranean diet but comprises foods traditionally sourced in Denmark, Finland, Iceland, Norway and Sweden. Staple components of the New Nordic diet include berries and fruits, fatty fish (herring, mackerel and salmon), lean fish, legumes, vegetables (cabbage and root vegetables) and whole grain cereals (barley, oats and rye). A notable point of difference is the use of rapeseed (canola) oil instead of olive oil. The Nordic diet is predominantly plant based and locally sourced, thus ensuring more environmentally friendly production with reduced waste when consumed within the Nordic region. The report found that a total of 15 countries in the European Region currently recommend or implement policies based on the New Nordic and Mediterranean diets, emphasizing the health benefits and – in some cases – the cultural significance of these diets. In addition, the Nordic countries in particular have demonstrated collaborative policy-making through cross-country initiatives. However, the report found less evidence of policy development than expected and limited evidence that impact is routinely evaluated. To tie in with the launch of the report, WHO/Europe is hosting a 1-day symposium with Member States from the Mediterranean and Nordic regions with a view to exchange experiences, challenges and solutions. The symposium is jointly organized with the Nordic Council of Ministers. Topics under discussion at the meeting include how governments can use the Mediterranean and New Nordic diets to influence food identity and consumer demand, and to improve the nutritional quality of the food supply. In the long term, it is expected that such efforts can help shift diets towards more healthy and sustainable directions. 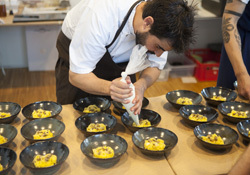 Given the focus of the meeting – on food culture and identity – the meeting also involves leading chefs, who are often major food influencers and important allies. They will contribute to discussions and demonstrate how concepts of healthy diets can be integrated into tasty and sustainable meal planning. The HEN report serves as an official source of evidence and was commissioned and developed jointly by the Division of Noncommunicable Diseases and Promoting Health through the Life-course and Division of Information, Evidence, Research and Innovation. The report and symposium contribute to the implementation of the WHO European Food and Nutrition Action Plan 2015–2020, the work of WHO/Europe on the Sustainable Development Goals, and the build-up to the third High-Level Meeting on the Prevention and Control of Noncommunicable Diseases. The primary goal of the event is to showcase and inspire countries to continue working actively with healthy diets, food identity and gastronomy.